Lesson 3: Where did we come from? In our last two lessons we have learned many wonderful things about God. In this lesson we are going to learn that God is the great Creator—the One who made all things. Have you ever looked at the stars at night and wondered how they got there? The Bible tells us how they got there—God made them! 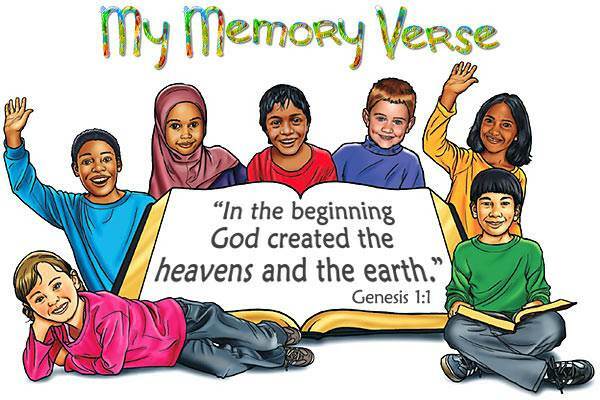 The very first verse in the Bible says, "In the beginning, God created the heavens and the earth" (Genesis 1:1). What does “create” mean? The word “create” means to make something out of nothing. Only God can do this. God made the sun, and He made the moon. He made this earth on which we live. God made all the stars that twinkle in the night. Some of these stars are so large that we could put the earth and the sun inside them and still have plenty of space left! 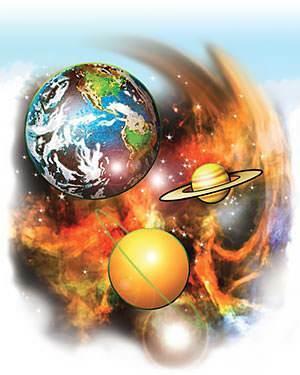 No one knows when God created the heavens and the earth. God has not told us when He did this. 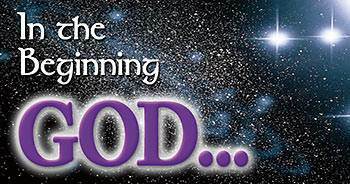 The Bible simply says, "In the beginning God created the heavens and the earth." Exactly when this happened no one knows. 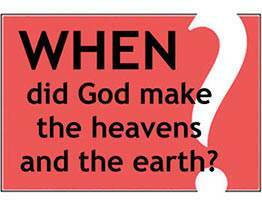 How did God create the heavens and the earth? He created them by His word! The Bible says, "By the word of the Lord were the heavens made; and all the host of them by the breath of His mouth" (Psalm 33:6). God just spoke, and the sun, the moon, the earth, and all the stars came into being. The Bible says, "For He spoke, and it was done; He commanded, and it stood fast" (Psalm 33:9). God’s word is powerful! 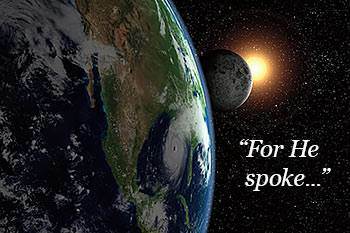 All God had to do was to speak and the heavens and the earth came into being. How do we know that this is true? We know because God’s Word says so. God made this earth on which we live. He made the hills and the mountains, the rivers and the lakes. He made the grass, the trees and the beautiful flowers. God made the fish that swim in the water. He made many different kinds of fish. God made the birds that fly in the sky. He made many different kinds of birds. God made the animals. He made many different kinds of animals. Then God created the first man and the first woman. Why did God create us? God created us to love Him and to be loved by Him. God loves us and He wants us to love Him. What should God do for this man that He created? Should God love this man? Yes, He should. Should God take care of this man? Yes, He should. Should God tell this man what He wanted him to do? Yes, He should. What should this man do? Should He love God? Yes, he should. Should he worship God? Yes, he should. Should he obey God? Yes, he should obey God. Would it be right for this man to say to God, "I do not have to obey You; I will do what I want to do!”? No, that certainly would not be right. The right thing for us to do is to love God, to worship Him, and to obey Him. God’s most wonderful creation was man! 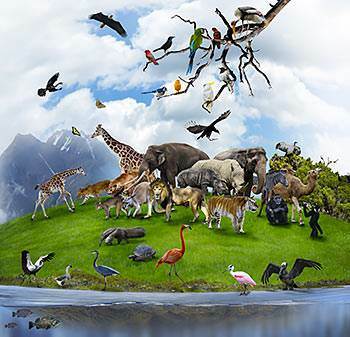 Man did not come up from animals by a slow process called “evolution.” He was created by God. God made man different from all other creatures. Man was created "in the image [likeness] of God." No other creature was created in the image of God. Only man was created in God’s image. This tells us that we are very special! God did not create millions of people. He created only one man. God called him Adam. God created a wife for Adam. Her name was Eve. The Bible says, "So God created man in His own image, in the image of God created He him; male and female created He them" (Genesis 1:27). God planted a garden for Adam and Eve to live in. It was called "the Garden of Eden." You and I have never seen a garden so beautiful as the Garden of Eden. In the garden was every kind of tree that is beautiful to look at and good for food. A river of pure, sparkling water flowed through the garden. Adam and Eve had everything they needed to make them happy. 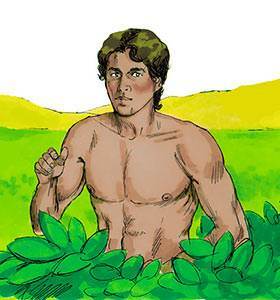 God told Adam and Eve that they could freely eat of the fruit of every tree in the garden except one. They were commanded not to eat the fruit of "the tree of knowledge of good and evil." God said that, if they ate the fruit of this tree, they would surely die. Adam and Eve were very happy in the beautiful garden which God had prepared for them. In the cool of the evening, God came to walk and talk with them. This was the best thing of all. God was pleased with His creation. 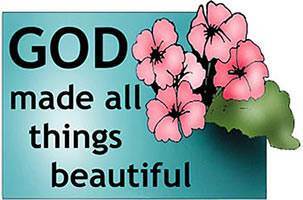 He looked at all that He had made and saw that it was “very good.” The Bible says, "He has made everything beautiful in His time…" (Ecclesiastes 3:11). 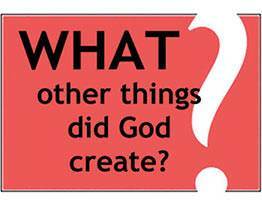 The Bible tells us why God created all things. He created them for His pleasure and for His glory. The Bible says, "You are worthy, O Lord, to receive glory and honor and power: for You have created all things, and for Your pleasure they are and were created" (Revelation 4:11). You may wonder, "If God created everything perfect and beautiful, why are there so many bad things in the world today?" The reason is this: An enemy brought sin into God’s beautiful world. In our next lesson we will find out who this enemy is and what he did. Now I want to ask you a question. 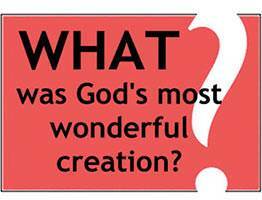 Of all the wonderful things which God created, what do you think He loves most of all? He loves people most of all! God loves all people. He loves you and He loves me. We were created in God’s image. No other creature was created in the image of God. This makes us special. We can know God. Animals cannot know God, but you and I can know Him; we can love Him; we can talk to Him in prayer; and we can worship Him. This makes us very special. God can live in us. 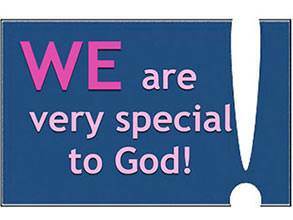 The most wonderful thing about us is this: We were created in such a way that God can live in our hearts. This makes us very, very special. Would you like for God to come to live in your heart? Then tell Him this. Tell Him, "Dear God, I really want You to come to live in my heart." Tell Him that you believe that Jesus is His Son and that He died for your sins and rose again to be your Savior. Thank Him for giving His Son to you to be your Savior.